just a cupcake with a candle would be fabulous. but that is next month. for now the dance will do. it will make all the other needs go away. It is harder to talk about the small things than I'd thought it would be. Those big things - less fast time, more slow time, more space, my own house, more privacy – those are easy and I only need one sign for them. More money. This, however, is hard. It is seated in sadness and jealousy, and blogging made me do it. First made me aware I needed it and was keeping my mouth closed and had been keeping my mouth closed for my entire life, and then made me noisy. We celebrate each other out here in the blogosphere, we throw smooches across the miles and send surprise packages and we know each other. No one in my family knows my favorite colors, but y’all do. Y’all do. I would never say these things out loud otherwise. You should be, but you are not celebrated if you on purpose remain single, thinking marriage a sacred union, vows not to be undertaken lightly, thinking divorce the last option if it doesn't work out; there are no "staying single" showers, no places to register for lingerie and vacuum cleaners, even though you need that stuff just as much. There are no special luncheons, no gorgeous dress, no colors to choose, no cakes to taste. You are never the star for the day. You buy cards and gifts for years and years, for 2nd marriages, and even 3rd, and you keep your mouth shut when people – even your friends - say of someone "she's never been married, you know", a not-so-secret code for something-is-wrong-with-her, and you keep your wallet open and you buy a new dress to wear to celebrate someone else. And when you type those words, they sound familiar, as if you’ve already talked about this before, and you understand just how deep this hurt goes. You should be, but you are not celebrated for paying your own bills, for achieving small dreams, for writing words that can make people cry. You don’t, but you should always have birthday parties with streamers decorating the room, and you should always get birthday cakes, at least a cupcake, and there should be balloons and a wrapped present or two, even though you are a grown adult woman. You need that cake, even if you don’t take one bite because your belly is jumping for joy. You need those streamers, you need those flowers, and you shouldn’t feel guilty for needing it. You should stop blaming yourself - "if I were less shy there would be parties”. There is truth in that; you are loved, you are appreciated, and if you were less shy, there might be parties. But you aren't. You are who you are. And you still need it. my shyness is too great and my anxiety keeps me home. I have no desire for large crowds. But my heart needs to be celebrated. And, of course, it needs that dance. with a sign in our hands needing something." Graciel decided we needed to show our signs. or leave your sign as a comment. and now let's dance. let's celebrate you. us. me. all of them, too. how do i even respond to this? my heart has burst out of my chest and is now leaking in my hands. this is so raw and true and gorgeously expressed, and god yes, i understand. you know, i understand. darlin', that dress is stunning and truly, i gasped when i saw it. the BEAUTY of that image! I too feel a lump in my throat for this gracious and heartrending post on being left out. Oh Debi your photos and words are priceless. This is so much more than thought, and I have to admit I'm a bit jealous of how real your post is...how honest. There is something palpable here; something every single one of us can relate to. Oh I think I've learned something huge from you today. Thank you for that. I would love to "celebrate" with you anytime. Caroline - I watched The Big C last night and laughed - it was her birthday and her birthday cake was a wedding cake because white cake was her favorite and the bakery had a never-picked up wedding cake. It was such perfect timing! Love you back! Gillian - Bless you. If you knew how many times I put those words up and how many times I took them down, you would laugh. And seriously, no joke, after the final decision to leave them up, I needed some Pepto-Bismol. LOL! Oh, Debi!!! *deep sigh of love for you* So true, so true; the celebrations for the things we do well, & courageously, & as the normal course of our lives, often get taken for granted. But not here! I need to see my son's million-watt smile & hear his laughter over a cheeseburger & iced tea. I need to do it all again. And yep - do it all again. Wow. I'm not ready to publish my sign yet. But I'm turning 50 next week, never been married, no children, and that is genuinely fine with me. I have not met the man that I could imagine myself tethered to for infinity, but that does not mean I won't some day. The point is - I loved your message in this post & totally relate. I can't be condsidered shy, and there are parties, thanks in part to a great group of friends that I don't always remember to be thankful for. But I still crave being the center of celebration occasionally, and I love the "sign" concept. I stand and salute in your general direction, as a celebration of YOU. I don't mean to ignore this marvelous content but I WANT THAT SKIRT!!!!! WAH!!!!!! I stunbled on Graciel/s site and then found yours. I celebrate you Debi, with your beautiful words that touch hearts and your beautiful art that doesn't need words to open hearts. You are a true and beautiful gift to the world dear friend! I do celebrate you, truly, every time I come here. Your words are always a party, sometimes a crazy happy one with streamers, sometimes a quiet solemn one with a single candle. And all the moments in between. Everything you said here is true. Everything you say here always, is true. You should celebrate that skirt. i couldn't let go of hope, i have been thinking about it ever since your first post about the sign. now i'm going to go and bake you that cake. Beautiful Debi, I am raw from my own Sign Day, too raw to say all the things I need to say in response to this. So I will have to say them later, but for now, know that your words have touched me very deeply and I am so extremely grateful for you and that you are incredible and deserve much, much celebration. i finally got my sign done....waiting until the last minute just isn't for me anymore.....i think i worked up a sweat ! I don't know what to say; I'm so clumsy with comments. I celebrate you everytime I see in my feed reader that you've updated your blog. I know there is something beautiful and real and honest there (oh the honesty, I value it so much) and my heart starts clapping and jumping up and down, and sighing. C.S. Lewis said: "Friendship is born at that moment when one person says to another: What! You too? I thought I was the only one." You are not alone, and because you write about you write about and share it, neither am I. Thank you. "Ask - and it shall be given. Seek - and ye shall find." That's my sign...I would hold it sitting at a corner, next to the Target parking lot --- or on the hill, next to the tree line behind my barn. I am no more biblical than I am Amish...but I do find these words bear such truth. I also work for a community action agency -- working to alleviate poverty. "Some times I am the answer." Maybe that should be my sign. You are celebrated. Thanks for your truth. i guess i've been in a bad place lately - what's been on my mind lately is a need for friendship. 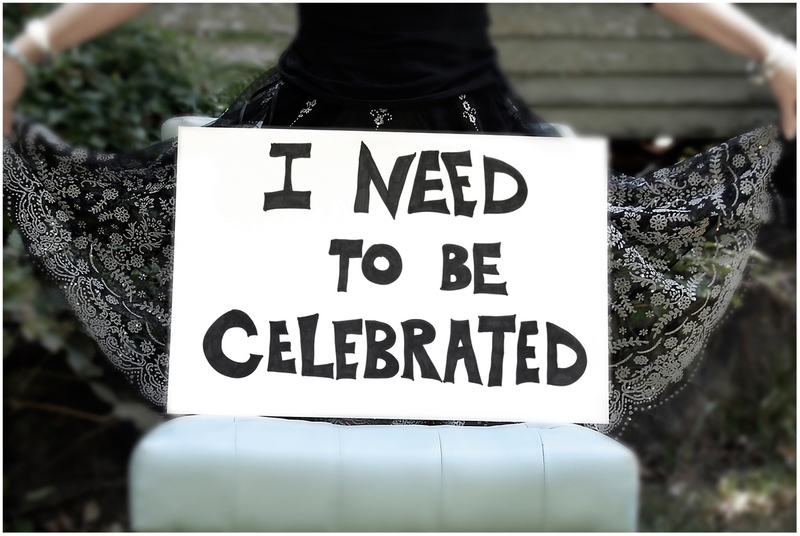 what i need is to feel worthy of being celebrated. what i need to is be invited. but know that i think you are every bit worthy of celebration because all of those things - single and achieving your dreams. now go dance with Michael under a star filled sky in that wonderful skirt of yours. 'Neath the cover of October skies." here's to celebrating you...and what you wrote 10 yrs ago truly has struck a chord in me. what powerful words and humbling ones at that. thank you, debi. warmly. I want to cry because I could have written every word of this post myself (although, not as beautifully)...because I feel these exact same things. Because I feel as though I am grieving a life I may never have (and not even sure I want to have)...because all of this is so incredibly close to my heart. But I also want to cry...from relief. To know that I am not the only one who feels this way, and neither are you. The world is a big BIG place with so many other souls making choices that are different from the norm...and you are so right...we all need to be celebrated. We all need a day of our own...with the dress and the cake and all things pretty and meaningful. Now I really am crying. I couldn't do a sign of my own. I felt silenced. I felt conflicted. I just had a weekend with my parents that was truly childlike and magical. And it turned all of my emotions around and around and upside down and left me absolutely confused as to what my sign should say. I forgot, this weekend, what I was feeling last weekend. And then I read this post and I realize that my sign is here. These words are my thoughts too, that I just couldn't organize myself. Oh Debi, I just love you. And I celebrate you. Every time I come here. I am going to buy a cupcake today. celebrate, even if you are all alone. celebrate, it feels good and you deserve it! and celebrations usually involve cake... yes mam! Oh...and I forgot to mention....how much I LOOOOOVVVVEEEE that dress!!!!!! Did you dance? Under the stars? the october stars are texas at its best! Girl, you've started a very inspiring revolution. I NEED SOMEONE I TRUST AND RESPECT TO TAKE THE REINS ONCE IN A WHILE. Right now this person does not exist to me. But I will keep looking. I know I am a little late for sign day, but I couldn't resist. Your words and images are an inspiration and a source of comfort. Thank you! I need your skirt. Seriously! I need your skirt! OK. I had to say that. Now I'll go back and read. I just turned 56 this past Sat. on my return day from a two week stay as an artist in residence at the Petrified Forest National park. My conclusion: 2 weeks is not enough. I want more. Are we the same age? I can't remember (yah, the CRS thing-can't remember stuff) is really bad sometimes. Only 4 years to 60. 4 years. That calls for an out of the box celebration. For 50, I went solo down to Mexico for a week. Awesome. Beats a party any day. Life changing. Even beats a slow dance, I might add! So, what do you have planned for 60? I am going to plan on something special for each decade that comes to me. For 60, I think a month in Italy would not be out of the question. Or, something along that line. This post is tragic but beautifully written. What about throwing a party for yourself and inviting friends? I got married when I was 33 and remember feeling some of that same pain. Going to weddings and baby showers...co-workers with children who got to leave early b/c they had to attend Halloween parties. I'm glad this was posted. I have more friends in cyberspace than I do in real life too, and I am really glad I stopped by your blog. I came over from Beths blog, what a powerful post and how true this is. celebrate and dance and love to you. Beth's blog directed me here. Your photos are outstanding and your message is full of life and love. Beth and Relyn directed me here and I have come here before (on my own :)), but this post resonates with me so much. I will be 50 in a few months and have been going through a lot this past summer- I think in anticipation- wait- dread- of that. There are so mnay unresolved feelings and emotions with my life and I feel them all so closely ties into THAT number. Anyway- this is about YOU and celebrating YOU and all you ARE and DO! Hope you had your cupcake and your dance!! !